Making this smoothie is super simple! Add almond milk, plain or vanilla yogurt (non-dairy for vegan option), your favorite protein powder (I used Vega brand- it’s clean, plant-based and tastes so delicious) ice and lemon juice (important- this gives the smoothie that tartness of cheesecake) to a blender and whizz around for a few minutes. 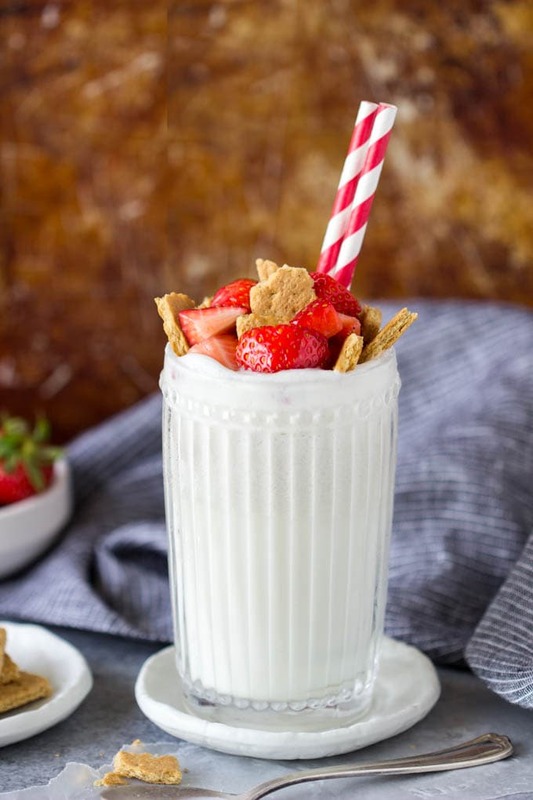 I topped this cheesecake protein smoothie with sliced strawberries and big chunks of graham cracker. 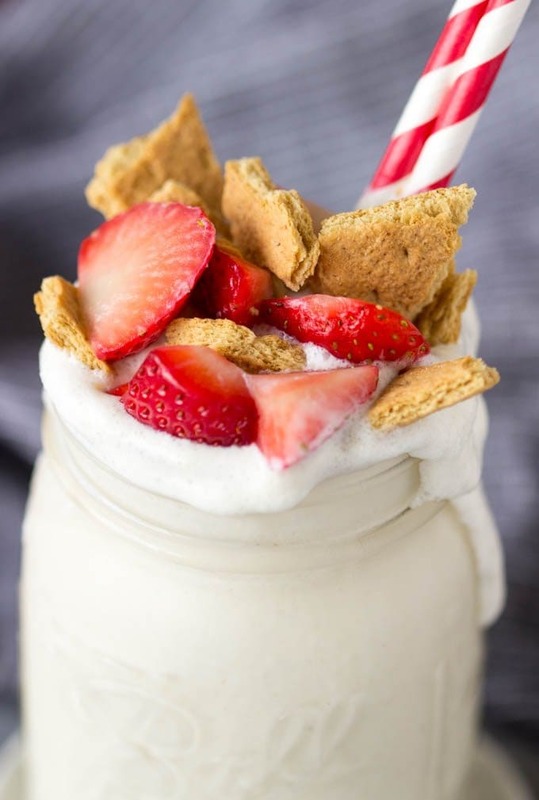 I like to have a few sips of smoothie and then dig my spoon in and get some crunchy sweet graham cracker and strawberry goodies. 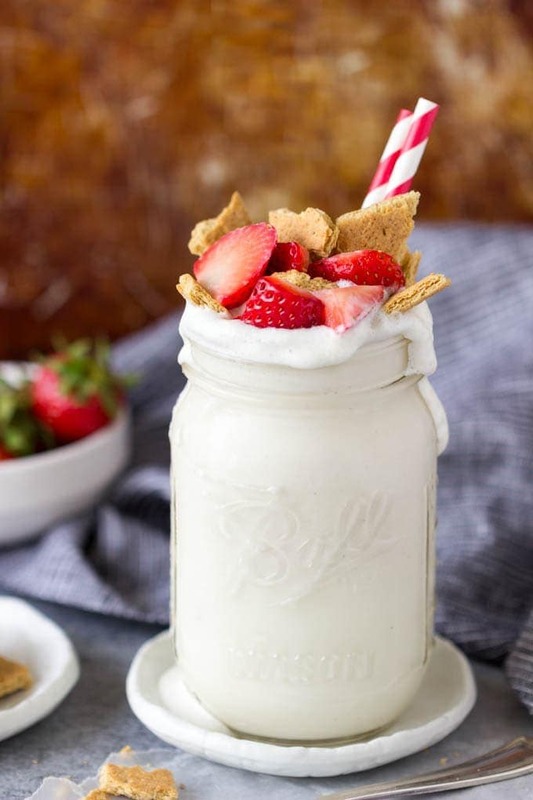 But if that’s not your thing, or you want to take your smoothie with you while you’re dashing out the door…you can add the strawberries and graham crackers in while blending. This would make an excellent smoothie bowl as well! 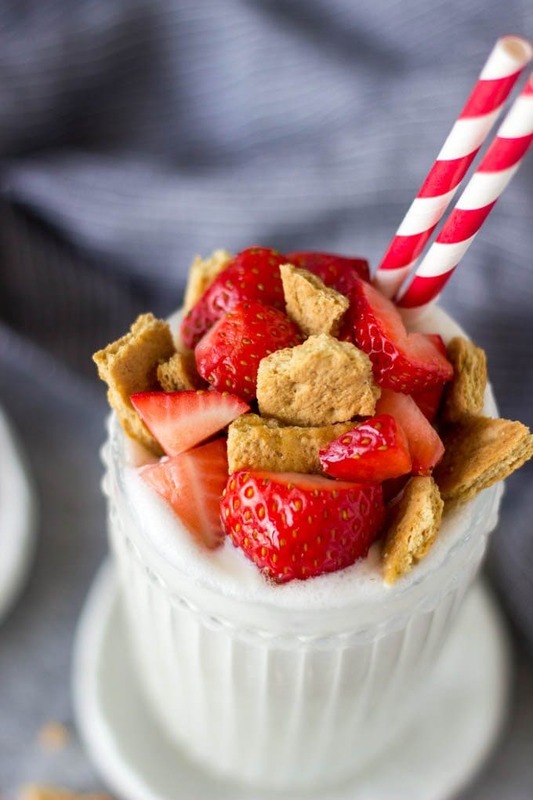 Just pour the smoothie into a shallow bowl (instead of a glass) and top with strawberries and graham crackers. Power up your morning with cheesecake! I mean a healthy strawberry cheesecake protein smoothie that is! Blend almond milk, yogurt, protein powder, ice and lemon juice thoroughly in a blender. Top with sliced strawberries and crushed graham cracker. 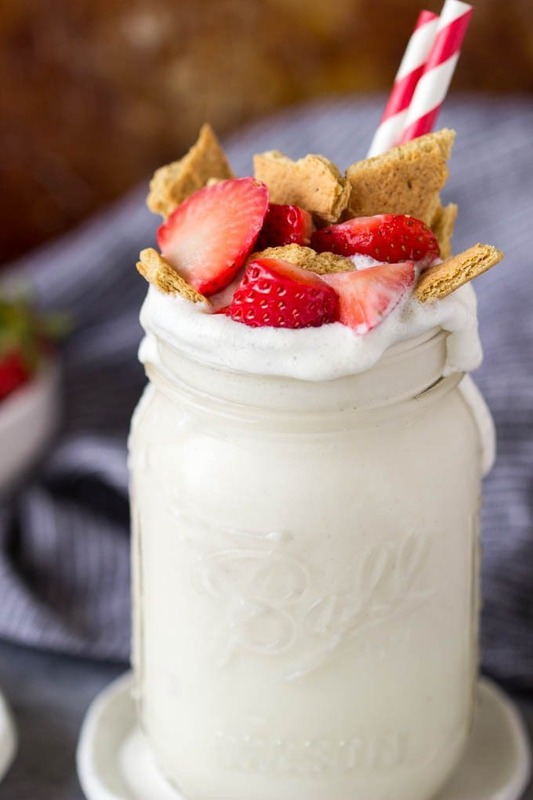 Alternatively, you could add the strawberries when blending and top with just crushed graham cracker. * Nutritional values are for the smoothie WITHOUT the protein powder (since calories and grams of protein vary widely between brands) You can simply add the calories/nutritional values for the protein powder of your choice. This protein shake looks so creamy and delightful! I would love cheesecake for breakfast! This looks wonderful! I do believe cheesecake is on the menu for breakfast tomorrow 😉 Thanks for the great idea!